Writing in the Sociology of Deviant Behavior, Marshall Clinard and Robert Meier note that while people are generally confident in their understanding of what constitutes deviance, the fact is that 'no consensus reliably identifies behavior, people, or conditions that are deviant,' particularly in relation to emotive issues such as drug use, homosexuality etc. Interest in behavior which departs from social norms or socially acceptability. Interest in the social processes which lead individuals or groups to be regarded as deviant. 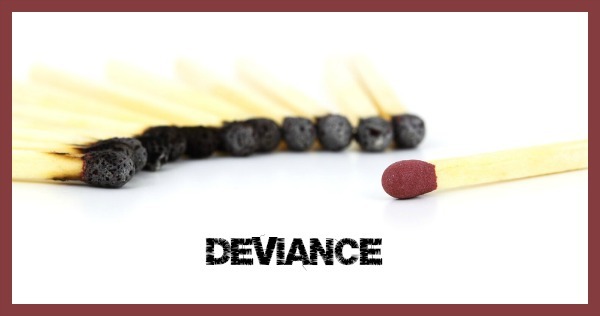 Interest in the reactive nature of deviance e.g. how certain behavior becomes identified, construed and propagated as worrying, threatening or disturbing. Insightful Animation about social deviance and social control from Dalton Conley's book, You May Ask Yourself: An Introduction to Thinking Like a Sociologist.